Welcome to the new view of Region 15 Choral Directors webpage. There is information on here for high school choral directors, middle school choral directors and general UIL info. Things have moved around on this new version. If you don’t see something you were used to seeing, click on Links. 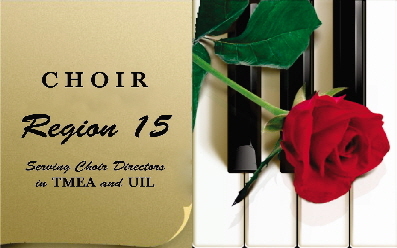 Browse our Web site for more information about Region 15 Choir. If you have any questions or would like to speak with a Region 15 Choir representative, please e-mail us at region15choir@gmail.com.